You need a vegetable spiralizer, like this one from Paderno: http://www.padernousa.com/tri-blade-plastic-spiral-vegetable-slicer/. You can order it on Amazon for about $25 bucks. It's worth every single penny. 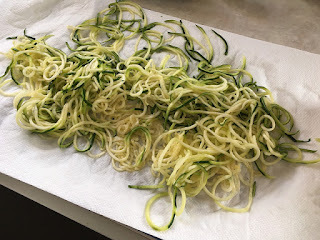 Use the smallest blade, and follow the product directions to spiralize as many zucchini as you need for a dish. Spread zucchini noodles in a single layer on some paper towels. Sprinkle generously with salt, and top with more paper towels. Leave alone for about 20 minutes, pressing lightly on the towels every few minutes to soak out released water. Rinse the zoodles under cold water to get extra salt out of them, then dry with more paper towels. You can use these in soups, salads, as spaghetti, in casseroles - you get the idea.